“This point almost never gets the attention it deserves”, tweeted Red Tory guru Phillip Blond, when a 2017 LSE poll on preferential immigration was brought to his attention. “Absolutely right and crucial”, responded Radical Orthodoxy guru (and Phillip Blond’s doctoral supervisor) John Milbank, who unusually ventured nothing further by way of convoluted philosophical exposition. And it’s easy to see why this poll doesn’t get the attention it deserves – principally because to ascribe merit to the research (or to propagate it by blogging and tweeting about it) is to expose the latent racism in the hearts of many Remainers, which is neither palatable nor conducive to Remainer eudemonia – the moral flourishing and political prosperity of those who demand a ‘People’s Vote‘ on the final Brexit deal (definitely not a re-run the 2016 Remain/Leave EU Referendum, you understand, but certainly ‘Remain’ must be one of the new options..). We’re all used to hearing about those xenophobic fruitcake Kippers and those anti-Christian racist and extremist Brexiteers who hate all immigrants, but Remainers are all liberal and tolerant, aren’t they? They’re all fair, impartial and completely unbiased and unprejudiced, aren’t they? At least (or especially) when it comes to skin colour and ethnicity, aren’t they? Well, feel free to complete the sentence (or paragraph). What’s striking – and no one is talking about – is that British voters prefer EU to non-EU migrants: the blue bars representing desired levels of European immigration are higher than the red bars for preferred levels of non-European immigration among all British voters. 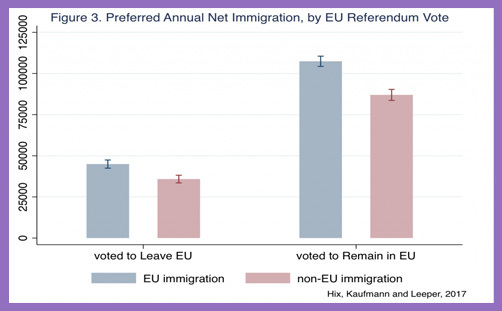 This pattern of preferring immigrants from inside the EU to those from outside holds across all social groups in our data. For example, figure 2 shows the patterns by social class and age. Middle class people (in ABC1 social grades) prefer more net immigration than working class people (in C2DE social grades), but both groups want fewer non-EU than EU immigrants. Similarly, younger people prefer more net immigration than older people, but, again, all want fewer non-EU than EU immigrants. Everyone’s a little bit racist (as the song goes), but what is absent from this EU/non-EU immigration discussion is the ‘Why?’ hypothesis. This is perhaps what Phillip Blond was alluding to when he said it never gets the attention it deserves; and perhaps why John Milbank didn’t issue a 15-deep Twitter thread of dense theo-philosophical pontifications. The answer is rather straightforward, and perhaps for that reason no one is saying it. Could it simply be that UK voters prefer EU immigration to non-EU immigration because they are ‘more like us’? Could it be an innate preference for whiteness? Perhaps for a shared understanding of Western Christianity and the homely residues of a common cultural heritage? Could it be a natural desire for homogeneous community and fraternal values? Perhaps an unknown yearning for St Benedict’s notion of Christendom? Could it be that UK voters prefer EU immigrants because they swell the pews of the Roman Catholic Church rather than agitate in ghettos and erect altars to foreign idols? Might it be an expression of a latent desire for a cohesive social gospel – a unified vision for human dignity, justice, mercy and compassion. Do UK voters prefer EU immigration to non-EU immigration because it represents at some profound level a common search for God; and if not for God, then the acceptance of an Enlightenment secularity which seeks the common good which derives from the common search for God and secular enlightenment? Is it because our fellow EU citizens are not some alien ‘other’, but because they are us and we are them, and we went out from them? EU citizens across the Channel (and the Irish Sea) are our immediate neighbours, hungry and thirsty for those same values which give Britons meaning to our lives. They aspire to the same freedom and affluence; the same civility and political society; the same morality and religious identity. In all the fragmented pluralism, divisive relativism and arid logical positivism of the age, might it be that most UK voters find deep comfort in the echoes of a continental unity, based historically on reconciliation with God but now more concerned with securing and maintaining peace? Might it be that they sense a commonality on the ultimate source of love, goodness and beauty? Might it be that EU immigrants share the same concerns for the preservation of life, for the poor, for the environment and for the disadvantaged as Britons tend to have? Might it be that the soul of Europe, imbued with the ecumenical transcendence of St Cyril and St Methodius, broods upon us or dwells within us and makes us feel more ‘at home’ with EU immigrants because we are inheritors of the same Western civilisation of solidarity, peace, morality, human dignity and social progress? Is there an EU koinonia and fellowship which surpasses our affinity with all other human groupings? Could it be a dream of Christendom? Does this suggest an innate discrimination against other cultures and creeds which renders most of us – both Leavers and Remainers – ‘racist’? This point almost never gets the attention it deserves.